Home >> Generated from JAN's SOAR Information System on 4/26/2019 3:41:02 AM. This simple-to-install workstation easily transitions from sitting to standing for a versatile ergonomic work environment. 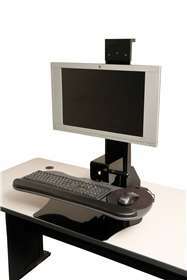 With infinite height adjustment, monitors can be set at any point along the upright track for comfortable viewing, while the tilt-adjustable keyboard tray allows for the proper typing angle at any position. The Positive Lock prevents drifting from the set position and easily releases with the push of a button. The included 27”W keyboard features a palm rest for wrist support, and mouse surface and catcher for right- or left-hand mousing. Single or Dual Monitor models available. White or Black.